Akuma Shogun is a character that has a few different sculpts and is a fairly popular figure in Japan. 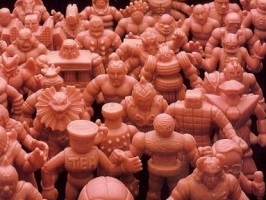 In the M.U.S.C.L.E. line there are two different versions – one with the blades on his arms (M.U.S.C.L.E. 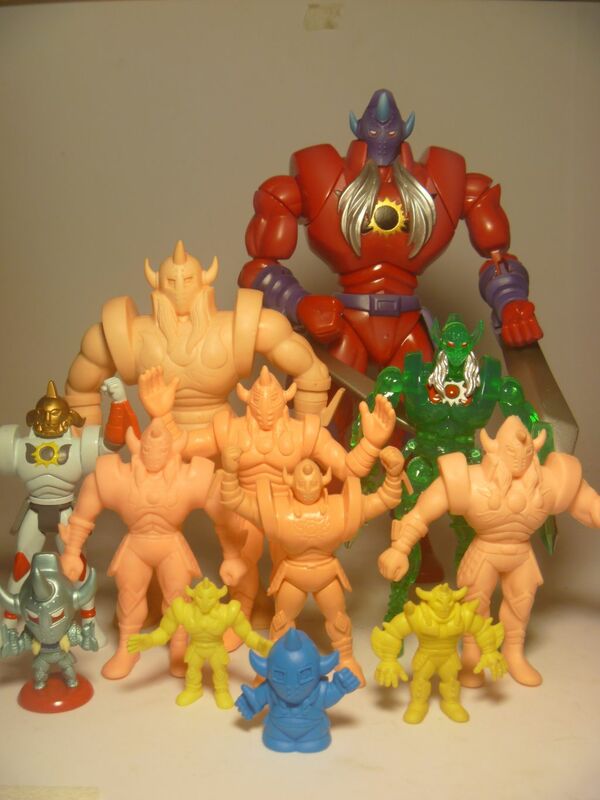 figure #111) and one without (M.U.S.C.L.E. figure #21). 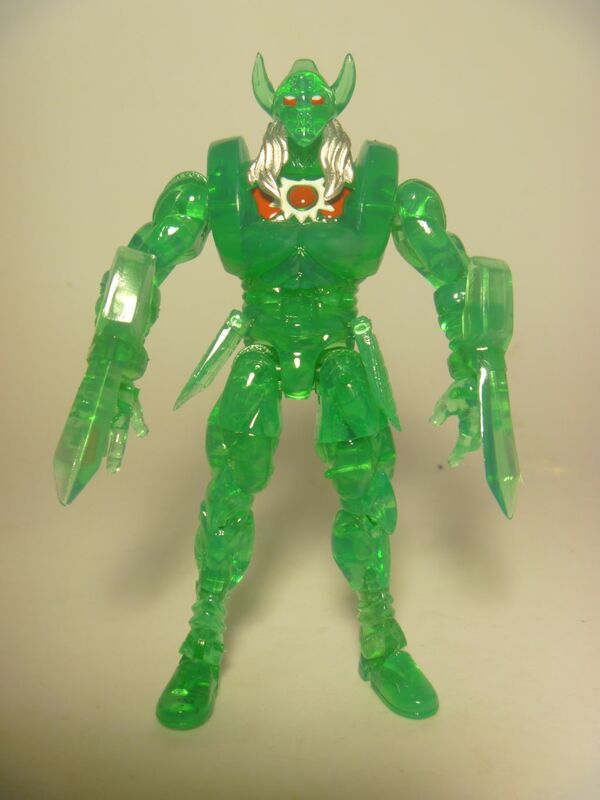 I much prefer the version with the blades attached to his forearms – a really cool figure. 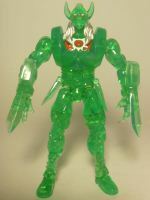 In fact, having the blades attached was the main reason behind me acquiring the red Romando figure pictured to the right. 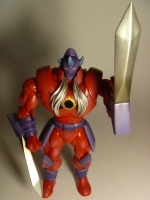 It is, in fact, one of my favorite Romando figures. Or, it was, until I pulled it off the shelf for this photo. Just by touching it, the left arm fell off. I didn’t use any pressure and this is the single thing I hate most about Romando figures – they are somewhat cheaply made in China and some Romando are just plain awful. 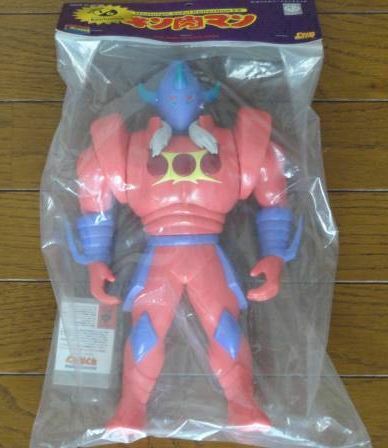 I prefer the 5 Star Toy line as they are much better made and in Japan. The problem is you also get what you pay for. A 5 Star Akuma Shogun will set you back approximately $150 vs. $30 for the Romando and although the color scheme is the same, the 5 Star does not have the blades on his arms so is it worth it? If you absolutely love Akuma Shogun, then I guess it is. Not enough for me to shell out $150 though. 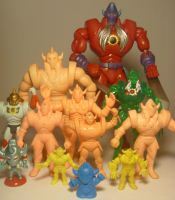 There are Akuma Shogun figures in all the regular lines as well – the two Deka figures, SD Kinkeshi, Great Kinkesi, and Battle Royal Kinkeshi. The other two I’d like to specifically mention are the Banpresto and a line I’ll call 80’s Bandai which have rubber limbs and plastic bodies. 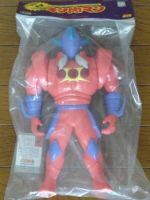 The Banpresto is unique in that his head is interchangeable with the gold King Kinniku head that some of you might recognize from the Kinkeshi Part 13. I think that’s cool so I did the swap. The 80’s Bandai line is a bit unknown to me in regards to origin and packaging, but I have 18 different figures and will talk about them a bit more in a future MMMM. The Akuma Shogun one is quite poseable with his arms above his head and therefore one of the best figures I have found in that line to date. So there you have it – Akuma Shogun is one of those figures that has a very diverse range – whatever your collecting tastes. 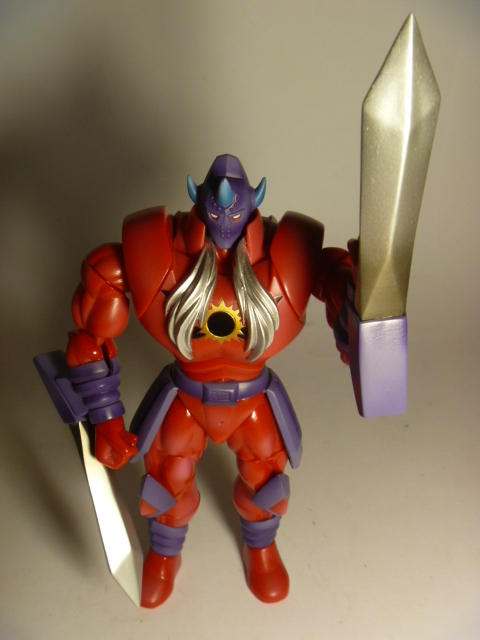 There is at least one version of Akuma Shogun that “looks pretty cool” and therefore worth owning. I know I’ve thought that! This entry was posted on Monday, July 21st, 2014 and is filed under UofM News. You can follow any responses to this entry through RSS 2.0. You can skip to the end and leave a response. Pinging is currently not allowed.